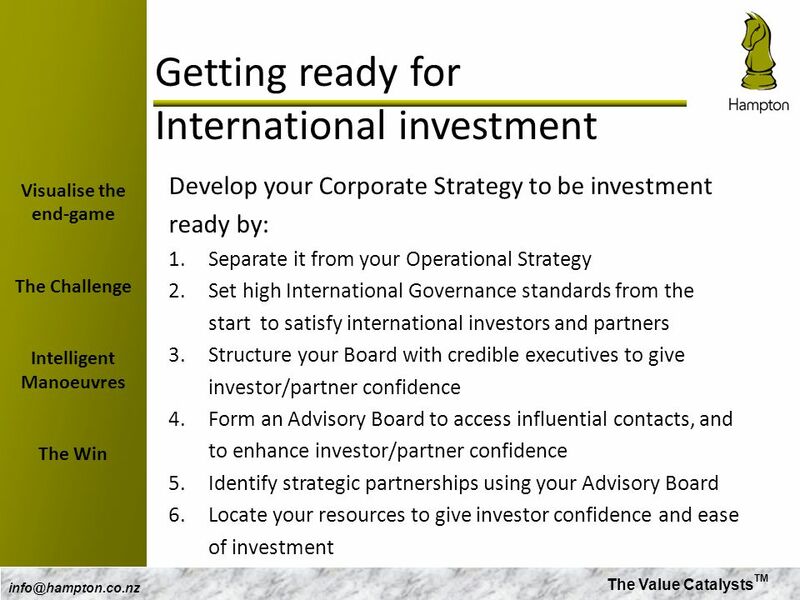 Getting your business Investment Ready Have you thought about this? 1 Getting your business Investment Ready Have you thought about this? 2 From Wellington to Rolls Royce Group plc. 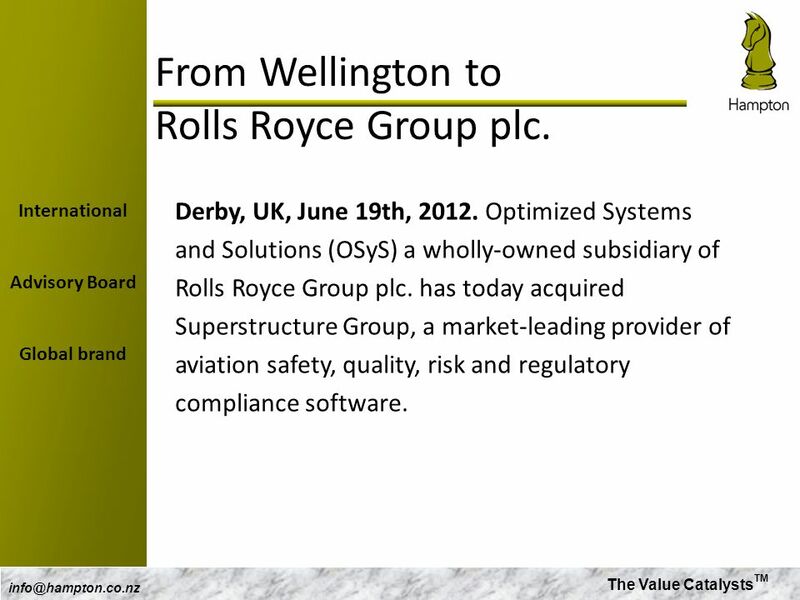 International Advisory Board Global brand Derby, UK, June 19th, Optimized Systems and Solutions (OSyS) a wholly-owned subsidiary of Rolls Royce Group plc. has today acquired Superstructure Group, a market-leading provider of aviation safety, quality, risk and regulatory compliance software. Download ppt "Getting your business Investment Ready Have you thought about this?" Kasbtv.com Starting a Global eBiz in Pakistan: Opportunities & Challenges Altaf H. Khan. CDCs 21 Goals. CDC Strategic Imperatives 1. Health impact focus: Align CDCs people, strategies, goals, investments & performance to maximize our impact. 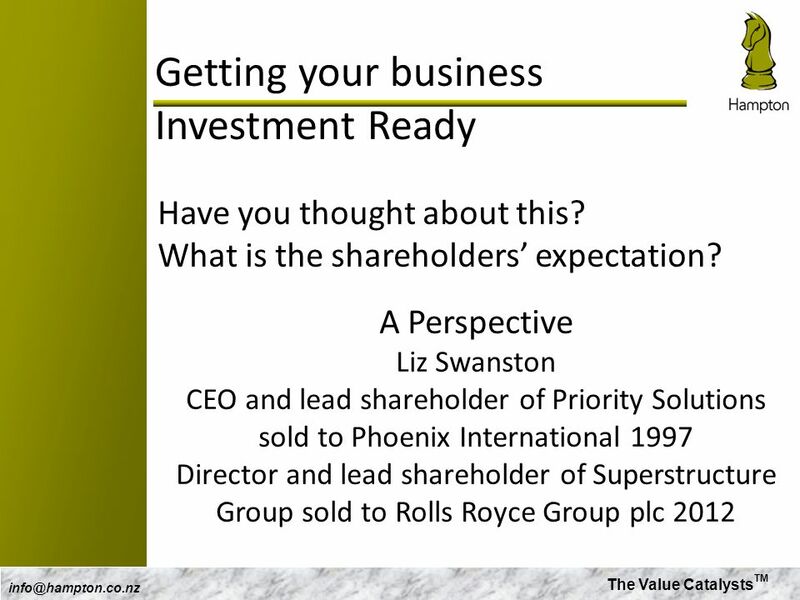 The Value Catalysts TM Commercialising Software Products A Perspective P resented by Liz Swanston, Managing Director. 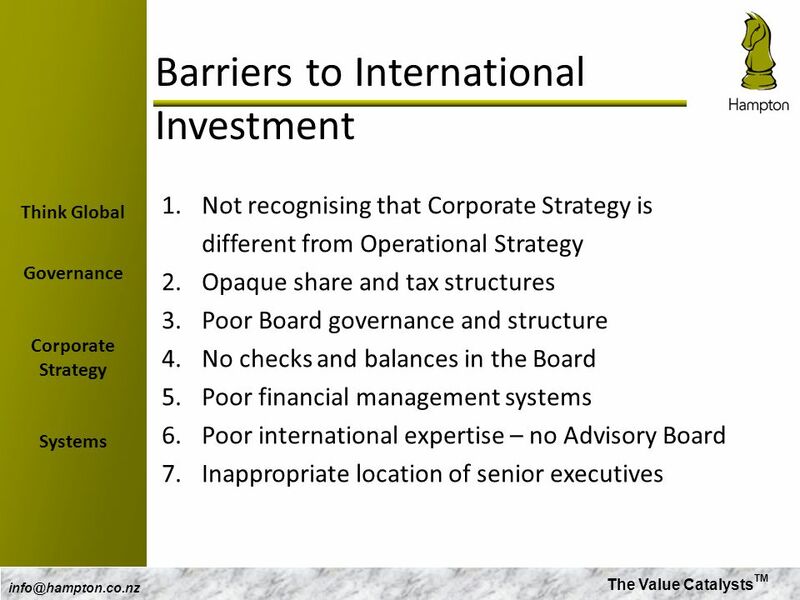 Key responsibilities of the Board Global Corporate Governance Forum Corporate Governance Leadership Program July 9-15, 2006 Chris Pierce Global Corporate. Business Development Licensing Strategic Marketing HFA-Consulting.com Pharmaceutical Business Development & Licensing Consultancy HFA provides specialist. W O R K P L A C E F U T U R E S THE CRYSTAL February 12 th, 2012 With thanks to our sponsors. MANAGEMENT DIRECT CONTROL CO-ORDINATE. MANAGEMENT FUNCTIONS 1. planning – making decisions / policy / methods - to achieve the objectives 2. co-ordinating. Page 1 Recording of this session via any media type is strictly prohibited. Page 1 Selling Your Risk Management Program. GlobalScot An International Business Network Jim Reid, Stakeholders & Networks Director Scottish Enterprise. Artemis Ventures, LLC How to Create A Killer Business Plan and Financing Pitch Christine Comaford Managing Director. Find. Create. Increase. TM Copyright 3forward, 2009 We Know What Keeps Sales Leaders Awake At Night. © 2004 KPMG LLP, a UK limited liability partnership and the UK member firm of KPMG International, a Swiss cooperative. All rights reserved. The KPMG logo. Agile insurance carrier - What the carrier has to look like? Glenn Lottering Senior Director, EMEA Insurance Product Strategy and Sales Consulting. THE EVOLVING ROLE OF THE INED JOHN HARTY. Harty International Executive Search John Harty A look back to 2008 Where are we now today What does the future. Human and Technology Capital Advisors, LLC “Where Financial Accretion Intersect with People and Technology” April 3, 2008. OTM 6.1 / GTM Update and Agility China Case Sharing.